"In an America of the near future, or perhaps the recent past, where men can only wed others of their kind, and women are relegated the tasks of breeding and housekeeping, one happily married couple, Jakob Blythe and Tobias Folwen, have their bliss briefly interrupted." 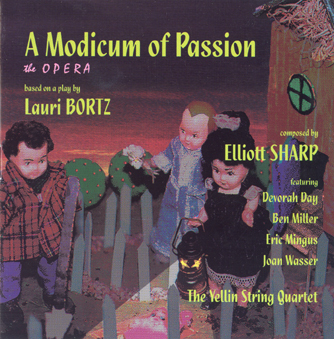 Thus begins the tragic-comic opera A Modicum of Passion, based on the play by Lauri Bortz, with a musical score composed and conducted for string quartet by Elliott Sharp. This release features an all-star cast of vocalists: jazz sensation Devorah Day, punk prince Ben Miller (founding member of Destroy All Monsters), R&B crooner Eric Mingus and indie rockette Joan Wasser, plus a fabulous four musicians--Stephanie Griffin, Conrad Harris, Amy Kimball, Garo Yellin--who are accomplished in all of these genres and more. A Modicum of Passion is a woeful tale of depraved indifference. In this microcosm, empathy is shattered by surrealistic time/space, and love fails to conquer much, if anything at all. The story unfolds in classic operatic format as Elliott Sharp's expressionism takes eerily beautiful twists and turns. This is Sharp at his most lyrical and gothic: the hummable melodies will no doubt surprise his ardent followers. But, loveliness aside, Lauri Bortz's darkly absurdist libretto has found its perfect musical match. 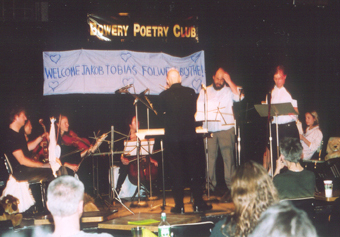 The CD release party for A Modicum of Passion took place December 12th, 2004, at Bowery Poetry Club in Manhattan. A concert performance of the opera was given with most of the original cast, conducted by Elliott Sharp. A Modicum of Passion was given a #1 pick by Joe Harrington in the Village Voice's 2004 Pazz & Jop music critics' poll. In Earshot Media's January 2005 report, A Modicum of Passion was 101 of 200 records favored by Canada's biggest college radio stations. The opera spent the entire winter of '05 on the charts of WXDU, Duke University's station. It also received airplay on KDVS (UC Davis) and KZSU (Stanford) in California. Purchase the CD A Modicum of Passion via Paypal for $15.00 postpaid worldwide.